As the director of risk management and chief emergency management officer at SU, David Pajak looks at the details with an eye on the big picture. In their shared mission and vision, the Risk Management Department, Environmental Health and Safety Services Office and Emergency Management, all of which Pajak oversees, are tasked with protecting the University’s people, buildings, finances, resources and reputation helping it to meet its academic, social and economic goals. 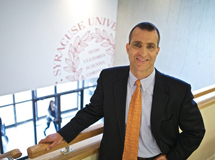 Pajak, who reports to the University’s Executive Vice President and Chief Financial Officer Louis G. Marcoccia, directs and coordinates risk management, environmental health and safety programs, emergency management, litigation and claims management, property and liability insurance, contract reviews and workers’ compensation and disability benefits. “We strive to create the appropriate programs, policies and procedures, and training to balance risk and reward across campus,” he says. An important and seemingly vast responsibility with so many variables for Pajak and his office, the work is made easier through effective communication with partners across campus and promoting the idea across campus of thinking in terms of managing risk. Pajak, who earned a bachelor’s degree in safety sciences at Indiana University of Pennsylvania and later obtained the Associate in Risk Management designation, has much experience in the field. He came to SU in 1990 after working at George Washington University Medical Center and American University in Washington, D.C. In 2008, Pajak, who earned an M.B.A. from the Whitman School of Management in May, was appointed chief emergency management officer. He also serves as vice-chair of the Campus Emergency Planning Committee. “If you think about emergency management, there can be inclement weather, crises abroad, data breaches of sensitive information and utility outages,” Pajak says. But planning is always the key—and getting leaders to think in terms of an all-risk approach, anticipating problems, allocating resources and communicating effectively are important. His office also keeps up with emerging regulations, such as under the Higher Education Opportunity Act, and making cost-beneficial decisions or providing information to stakeholders who need to make decisions. For example, although not required by law, in 1999, the University initiated a five-year, $12 million plan to retrofit all of the University-owned residence halls with fire suppression sprinkler systems, and in 2007-08 the University complied with various federal and state environmental regulations related to the disposal of contaminated soil from the Center of Excellence. Pajak credits his staff for the work that they have achieved. “I believe if you have people who trust, respect and care about each other and are committed to getting the job done, they’ll make it happen,” he says. Pajak’s work has garnered him respect from his colleagues across the country. Earlier this month, he was honored to receive the 2012 Distinguished Risk Manager award from the University Risk Management and Insurance Association (URMIA). “It is something to be shared with the risk management, environmental health and safety services and emergency management staff and the University,” says Pajak, who served on URMIA’s board of directors and currently chairs its Government and Regulatory Affairs Committee. Outside of his professional life, Pajak enjoys traveling with his wife, Janey ’00, practicing tai chi and cycling—he’s logged 2,500 miles this year. You might also find him fishing for trout on local streams. “Central New York is a godsend for cyclists and being outdoors,” he says.